Senior Scientist, Cancer Therapeutics Program at the Ottawa Hospital Research Institute. Professor, Departments of Medicine and Biochemistry, Microbiology & Immunology, University of Ottawa. Co- Director, The ACTION Translational Research Initiative at the Ontario Institute for Cancer Research. 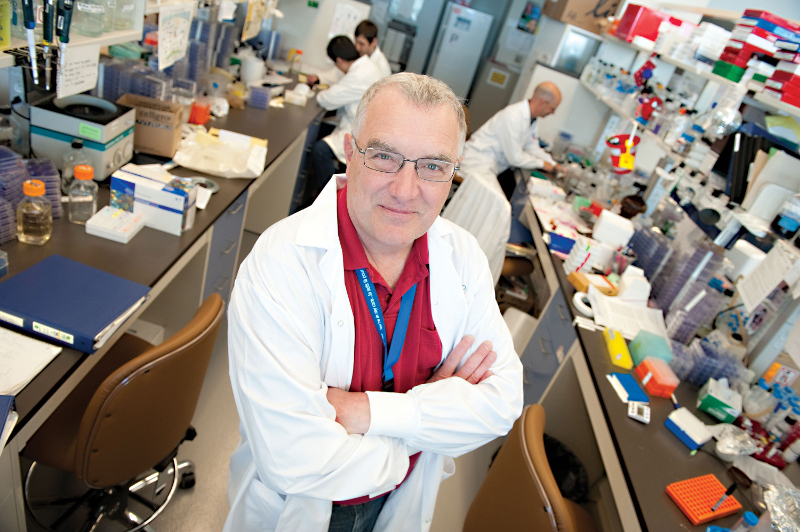 Director, Canadian Oncolytic Virus Consortium, Terry Fox New Frontiers Program Project Grant. And, of course, Scientific Director of BioCanRx, a Network of Centres of Excellence. The list of titles is impressively long. But for short, you can just call Dr. John Bell “inspired.” And all because he spent his PhD (in virology and immunology) studying a virus that did not cause any human disease. The virus, he says, was really biologically interesting – but at the time, in the 1980s, he would not have been able to get funding to continue working on this micro-organism. So, he switched his research interests to the cancer field, where he felt his training could be put to good use. It wasn’t that dramatic a switch. In studying cancer cells, he found that as they shed various genetic matter that allowed them to flourish and repel immune system attacks, they also lost their ability to repel viruses. In other words, they couldn’t fight viral infections – or, as Dr. Bell puts it, they were “uniquely sensitive to viruses,” viruses that didn’t affect non-cancerous cells. It was an “aha” moment of realizing that there might be a new and better way to fight cancer. “What we’re doing,” says Dr. Bell, “is giving the cancer cell a cold.” And, like all colds, the virus that was able to infiltrate the cancer cell also sparked an immune response, making it a one-two punch that aimed to knock out the cancer cell. And the timing couldn’t have been better. In the lab, research into viruses as tools to fight cancer was making good progress. But, in the honourable Canadian tradition (insulin, Dr. Bell points out, the signal Canadian discovery, has never been manufactured in Canada), these discoveries weren’t making it into the clinic. That’s where BioCanRx, a Network of Centres of Excellence, came in. Now in its third year of operations, its focus is on putting the necessary pieces in place to bring immunotherapy out of the lab and into the clinic. There are two parts to this kind of immunotherapy approach – first, infiltrating the tumour with a virus and second, sidestepping the tumour’s ability to repel immune attacks with something called immune checkpoint inhibitors, agents that “take the brakes off the immune system. The latter, however, can have negative consequences if the immune response spreads to healthy cells. Thus, there is a need to find more targeted, scalpel-like, approaches to developing checkpoint inhibitors, to diminish the harm while enhancing the benefits. Other areas of focus for BioCanRx include combination therapy – coupling the right virus with the right immune checkpoint inhibitor for maximum benefit – as well as enhancing CAR-T therapy, which involves engineering a patient’s own T-cells to better fight cancer. To date, CAR-T therapy has worked well in liquid cancers, but not so well in solid tumours. BioCanRx-funded researchers are making progress in these and more areas, holding out the promise of transition to the clinic. “I’m really proud of all the people in this network,” says Dr. Bell. What Dr. Bell is perhaps most proud of, much to his surprise, is the progress BioCanRx is making in engaging patients in its work. Indeed, this experiment is working out very well. For instance, at BioCanRx’s annual scientific meeting, patient representatives in attendance were matched with graduate students and post-doctoral fellows to explain the very technical proceedings. The patient representatives certainly benefited from these interactions, but equally important, the students and post-doctoral fellows began to learn a lot about the issues patients face and how their work impacts their lives. While Dr. Bell says he loves his job, he has just one regret. His own ability to personally carry out experiments in the lab has taken a hit. On the plus side, though, he has been able to recruit very bright trainees from around the world and across Canada. This exciting team he has assembled is currently working on identifying and engineering novel viruses that more robustly stimulate anti-tumor immune responses.